Day 2 in Toronto started a little too bright and early for our liking, given the late-night dining excursion of the previous evening, but an exciting, family-filled day awaited us. Not a bad deal! First up was dim sum with F.'s mom and grandmother in Markham. This being the first time I dined with F.'s family, I wasn't about to pull out the camera and ask that everyone wait to eat until I had the pictures I wanted. Maybe next time? Hm. Dim sum was exciting, of course, because no matter how many interesting or different things there are to try in this world, there is always a new food adventure to be had. And, at times, it's one that involves avoiding eye contact with your food and taking a leap of foodie faith ;) Once F.'s mom learned I was willing to try anything, she quite coyly added a few more dishes to the menu to (I think) test my claim. Truthfully, everything I ate was delicious, including the chicken feet. The only thing I might pass on next time was the carp: not terrible, but just a really bizarre texture that I can't say I loved. I'm always glad I try different things, though, because there's always a good chance I'll get to add a new favourite dish to the repertoire. That evening, we made our way over to visit my brother and his kiddies. My niece and nephew are the apples of my eye, and I don't get to see them very often, so I was naturally pretty excited about this particular part of the day. Sadly, his lady was out of town due to the passing of her grandmother, so we weren't able to catch up with her. Sunday being Father's Day, however, I was glad I got to spend it with my big brother; this being only his second. His upstairs neighbours were already barbecuing in the back yard when we arrived, so they invited us all to share in the food and frivolity going around on this gorgeous, June evening. Generous! We were treated to some of the fattest, tastiest ribs I've ever had: Charred slightly and crispy on the outside, while juicy and meaty on the inside. This was an occasion that called for the shameless and unabashed licking of fingers. No napkins necessary. Why waste the tastiness? On day 3, the final day, F. was off for meetings and additional travel, so I was left to my own devices. I had made plans to meet up with a friend of my brother's who had just spent several months travelling (and beautifully photographing) several countries in Asia. Excited to hear his stories, Dave and I scored a quick lunch at his new favourite haunt: Ka-Chi Korean Restaurant on St. Andrew Street in Kensington Market. Germophobes beware: In true Korean fashion, I asked him share everything with me. He graciously agreed! Our spread! 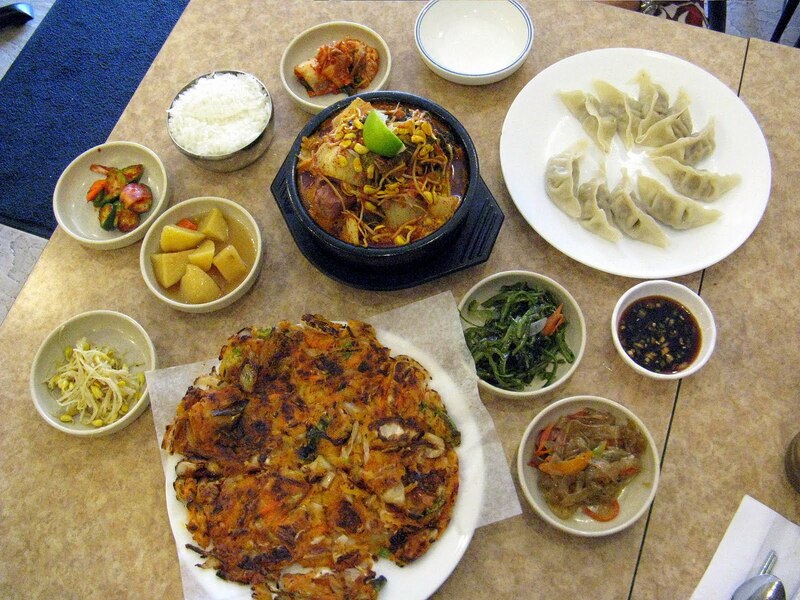 Kimchi pajeon, Gam-ja-tang, and steamed, beef mandu for the main dishes. Dave patiently waiting to dig in! 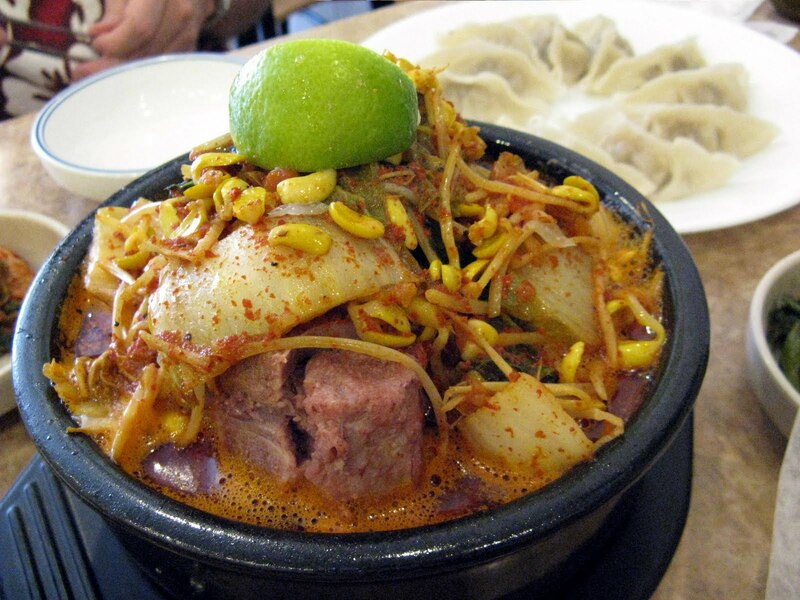 I have to say that I never really gave gam-ja-tang (pork bone stew) a fair shake when I lived in Korea. It smells really bad while it's cooking, and seeing as there was a gam-ja-tang restaurant in the same building where I worked, the smell usually prevented me from craving it or ordering it. I was definitely wrong not to sample more of this while in Korea, however, because of course the smell is long gone by the time you actually sit down and eat this at a restaurant. For about $6 at Ka-Chi, you get this huge, overflowing bowl of stew with about 5 or 6 chunks of pork inside, still on the bone﻿, and in a spicy, red broth. They could easily be charging more, but I was happy to see this restaurant staying true to good Korean food and value for money. We also ordered the kimchi pajeon (pancake), which is one of my absolute favourite dishes. I had a regular pajeon hole-in-the-wall I used to go to almost every weekend in Seoul, but I have to say, the pajeon here at Ka-Chi was probably the best I've ever had. 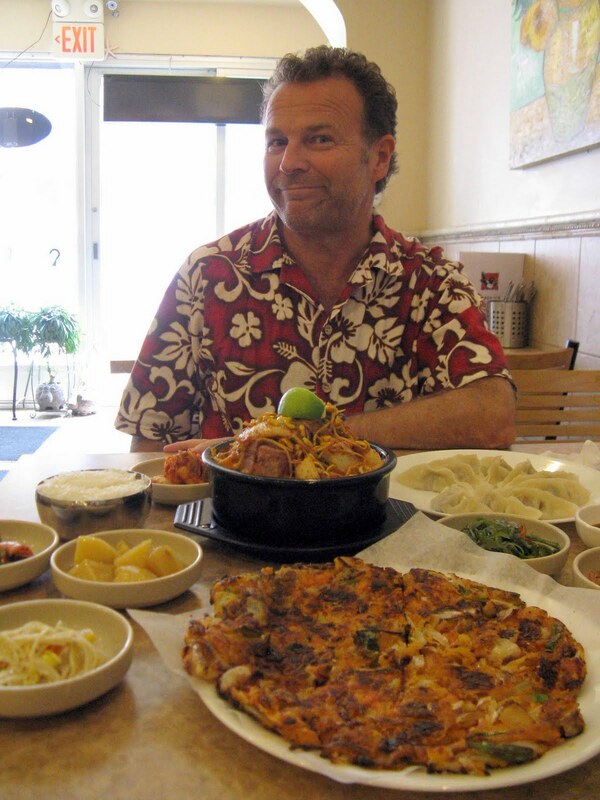 The plain, kimchi pancake is not on the menu; rather, it's there as one of several varieties of kimchi and seafood pancake. I asked our server if he could make it without the seafood (which I find can be hit or miss) and he readily agreed. It was thick, brimming with veggies and sweet kimchi (it turns sweeter when it's grilled, fried, or baked in anything), with crispy, perfect edges. Mmm. The steamed mandu (dumplings) were also great, because I find most of the Korean restaurants over here usually serve the deep fried variety. Steamed being my favourite - piping hot, with minced beef (or pork), onion, and garlic inside - I was blissfully happy and uncomfortably full with Ka-Chi under my belt. Quite a successful weekend away! Those were some Mac Daddy Ribs!! 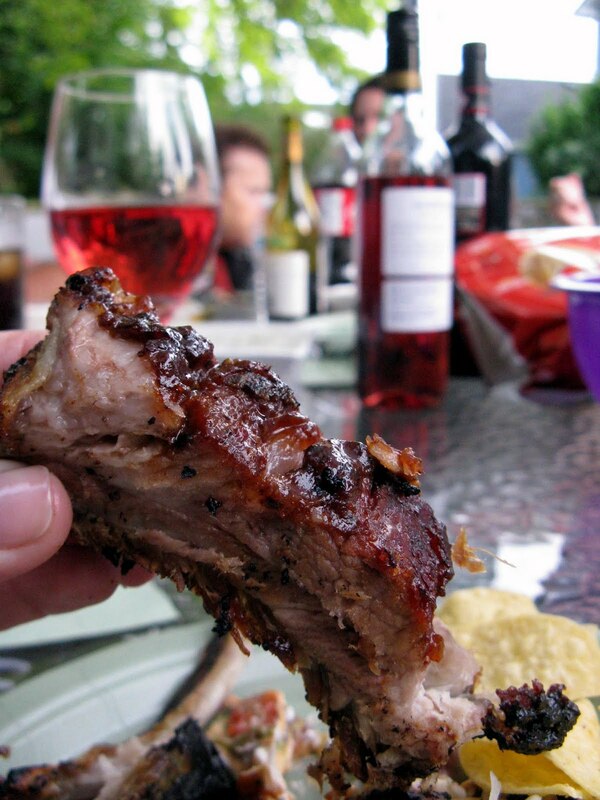 (Thats a Southern compliment..lol) Makes me want to fire up the grill, and go traveling. So many new things to try!! Wowza. I'm obsessed with anything pork these days! Those ribs look incredible. We just added some fine ribs to the menu at Union Street with Propeller Barbecue Sauce and a pulled pork shoulder sandwich. Come try! Oh... glorious! I've been trying to get to the Valley for weeks. I will absolutely come by for that sandwich when I do - soon! It's for reasons like this I could never (as much as I support the idea) be a vegetarian. Sigh.